Pregnancy isn’t easy. Sure, some of our bodies were totally meant to carry around another human being, but man does it make us feel tired, sweaty and generally not into the idea of glamming out and strutting our stuff in high heels — but we’re not celebs. For pregnant performers, the show must go on. These amazing musicians were about to pop, but sung and danced their heart outs anyway. Who knew it was this easy? Apparently, Shakira’s hips do lie because none of us could tell she was pregnant by the way she moved. In September of 2012, the singer took to her website to announce her pregnancy with boyfriend Gerard Pique. It was their first child. She subsequently shook her booty all over the place at the 2012 FIFA U-17 Women’s World Cup during a performance of “Waka Waka.” Who would have thought? Cardi B shocked fans when she finally revealed her pregnancy after months of rumors during an appearance on SNL. The rapper performed her first song while wearing an elaborate, ruffled outfit – it was the perfect thing to hide her not-at-all-small bump. That didn’t last long. During the second song, a powerful rendition of “Be Careful,” the singer opted for a white body-con dress that put her new curves on display. When the camera panned down exposing her bump, jaws dropped everywhere. Months later, Cardi B had another wild reveal – she had been secretly married to Offset for months even though we all saw him propose to her on stage. Leave it to Cardi to keep us on our toes. The world doesn’t deserve a queen like Beyoncé. Performing while pregnant is chump change for the star who announced her first pregnancy in 2011 during a massive, live performance at the MTV VMAs. That’s right: Cardi B took a page from her book, not the other way around. Beyoncé didn’t just slay the stage while pregnant with one baby – she gave an emotional performance at the 2017 Grammy Awards while pregnant with twins. 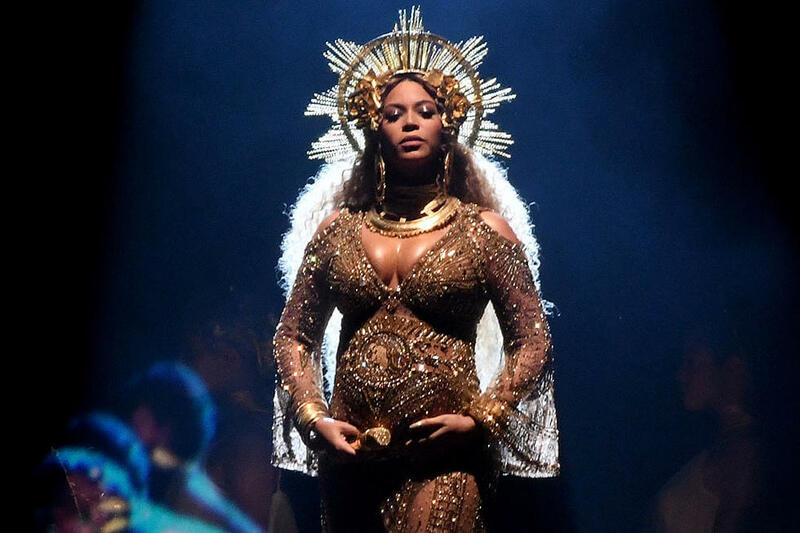 Yes, Bey was carrying two entire babies while balancing backward on a tilting chair and singing Lemonade’s “Sand Castles” and “Love Drought.” Because she’s a gift from the heavens above, she was also dressed like an angel in a Renaissance painting. It was and still is absolutely everything. She even got a standing ovation from Jay-Z and Blue Ivy! There’s a reason Kelly Clarkson won American Idol. The girl is a powerhouse of talent. 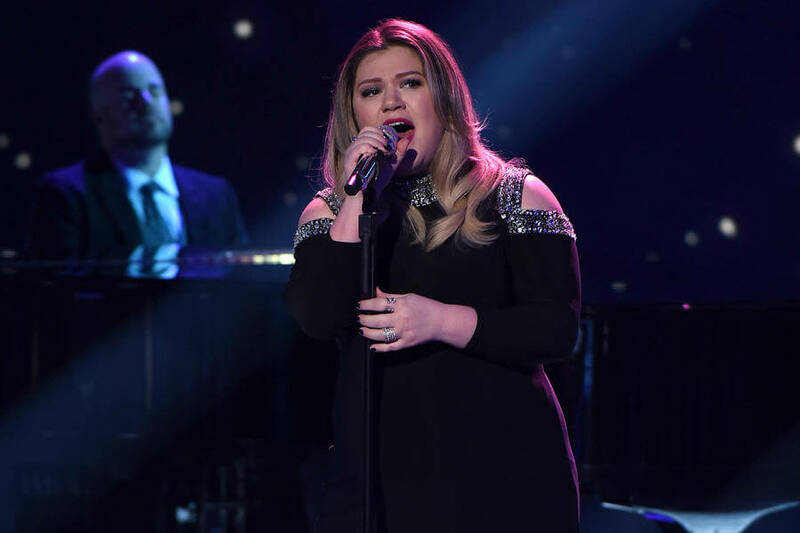 In 2016, she appeared on the show that made her famous for an emotional performance of “Piece by Piece.” Clarkson ended up letting her pregnancy emotions get the best of her and wept on air (subsequently, so did the rest of us). The song later went on to land the singer a Grammy nomination. 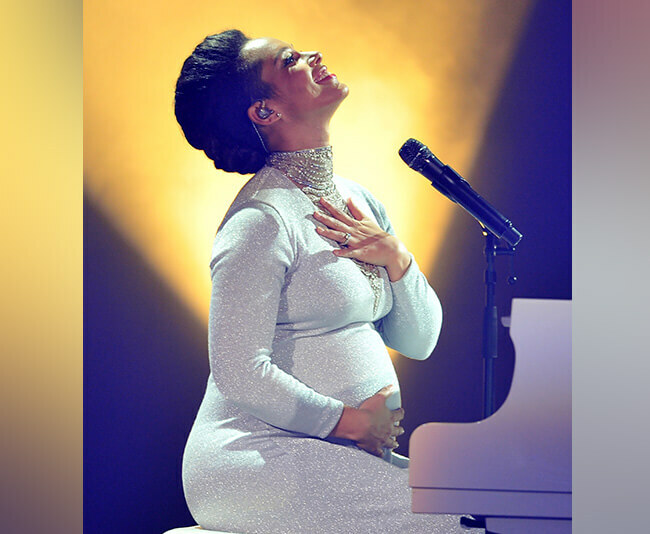 The 2014 MTV Europe Music Awards was nothing a pregnant Alicia Keys couldn’t handle. This was her second child, after all. Once you’ve had one, the rest are easy. Right? Maybe? The star showed up in a form-fitting, glittery silver dress that showed off her growing bump and sat at her piano to give a powerful rendition of “We Are Here.” Though Keys sat down through the performance, we have to give her a lot of credit. She was just weeks from her due date. That baby could have come at any second, but thankfully, it waited until closer to its due date. Alicia Keys may have performed a few weeks before her due date, but M.I.A. has her beat. Not even impending labor was going to stop the songstress from performing at the 2009 Grammy Awards. Her water may have very well broken on stage (but thankfully, baby held off because it knows the show must go on). M.I.A. had the unfortunate luck of her Grammy awards performance coinciding with the due date of her child, but she managed to hold it together and perform an energy filled rendition of “Swagger Like Us.” The way she bounces around on stage is pretty unbelievable considering that baby was so ready to go it could have bounced right on out. There’s something about those American Idol ladies and performing pregnant. Why are they filled with so much grace and talent when we’d be lumbering around like a sweaty mess? Most of us completely missed the fact that Carrie Underwood was pregnant during her performance at the 2014 Country Countdown Awards. The star announced her pregnancy in September and stepped on stage three months later. Underwood effortlessly ran through a medley of “Before He Cheats,” “All-American Girl,” “Cowboy Casanova,” and “Blown Away.” She ended with her then-newest hit “Something in the Water” which included a choir singing “Amazing Grace.” What better way to celebrate a pregnancy than a career retrospective of a decade’s worth of amazing hits? Baby’s going to have some big shoes to fill. Walk Off the Earth made a splash in 2012 when their cover of Goyte’s “Somebody That I Used to Know” went viral. Since then, they’ve become bonafide YouTube stars with a catalog of popular covers and originals. 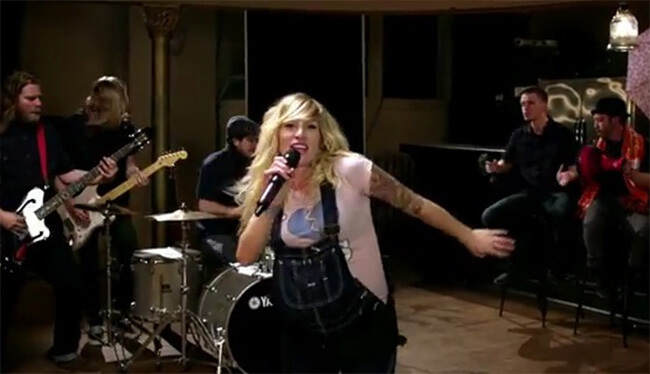 Though the band is made up of nine different performers, Sarah Blackwood may be the most impressive. She appeared at a sold-out SaskTel Saskatchewan Jazz Festival more than a little pregnant with her third child. That didn’t stop her from climbing to the front row and getting face-to-face with fans. “I want to let you in on a little secret,” she said at one point of their set. “This is not a beer belly. It’s not a food baby either.” Touche, Blackwood. Remember when Neil Portnow, the president of the Recording Academy, said “women need to step up” if they want to be included in the overwhelming male-dominated awards show? Ciara was pretty much laughing in his face. The dynamo performer wasn’t afraid to show off her baby bump at a 2014 Grammys after-party – as much as she admitted to having a little stage fright. By the time of the performance, a very pregnant Ciara already had an outfit change. She stunned on the red carpet in a shimmery Emilio Pucci gown then switched to a simple black tee and dramatic cape-inspired jacket. “The thing I love about something like this is that it’s all about encouraging women to work hard, and to do more of what you love,” she told CBS. This girl isn’t going to let a baby bump stop her from delivering an awesome performance. Jennifer Lopez didn’t just take her baby bump to a show – she took it on an entire tour. 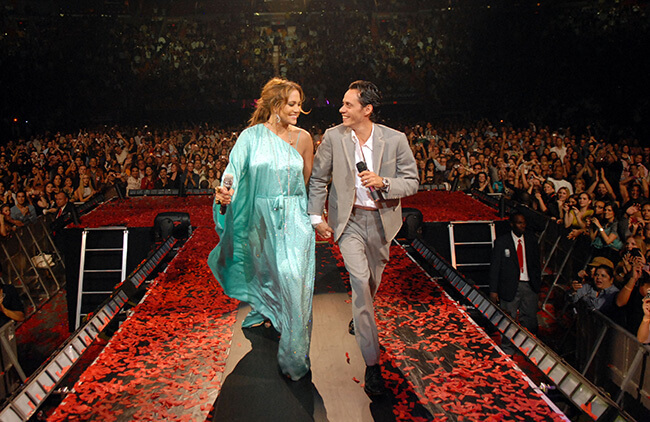 Long before the days of a rumored relationship with Drake, Lopez was married to singer Marc Anthony. The pair embarked on a 2007 tour, which Lopez slayed like we’d expect Lopez to slay. The only thing was that Jenny from the block was hiding a mega secret – she was pregnant. Lopez’s bump grew considerably through the tour and sparked a ton of rumors, but she stayed absolutely mum. If she was suffering from morning sickness, you’d never tell by the way she danced around on stage. The singer eventually broke the news on the final tour stop in Miami. Talk about dramatic, but bravo! 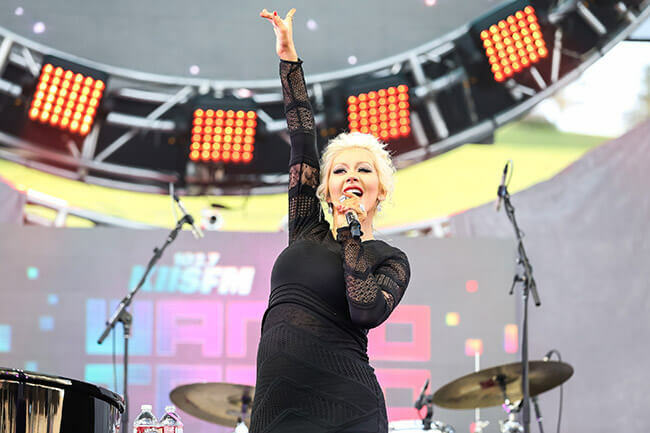 Christina Aguilera’s “Say Something,” a gutting duet with the pop-rock band A Great Big World, dominated airwaves in 2014. It was absolutely inescapable to the point where it bordered on obnoxious. Try walking into any grocery store, gas station or shopping mall without leaving with, “Say something I’m giving up on you” echoing in your head. It was impossible. Stefani announced her pregnancy by yelling, “I want you to say it loud enough so the baby hears it” during the sing-along chorus of “Crash.” Of course, she was met with an eruption of cheers because how could you not during a dramatic pregnancy reveal? Fort Lauderdale was the last stop on Stefani’s tour and the singer admitted that she wasn’t even going to do the shows because of her pregnancy. Thankfully, she was able to and delivered a performance that will always be remembered. As the singer of the most iconic Christmas song of all time, Mariah Carey has certain duties she must carry out around the holidays. At this point, she owes it to us and might as well be hanging out in the North Pole with the rest of Santa’s elves. It just isn’t Christmas until every shopping mall everywhere starts blasting “All I Want For Christmas Is You” every 20 minutes, and Carey isn’t naive. She knows it. The 2003 Oscars were special for Catherine Zeta-Jones. The actress won her very first Academy Award for her work in Chicago. Of course, that also meant she totally had to give us an epic performance. We were owed that much, don’t you think? Zeta-Jones was a whopping 8 months pregnant when she was joined on stage with costar Queen Latifah to sing a number from their hit musical. The moment was so iconic that Zeta-Jones reprised her role a decade later during an Oscar’s tribute to musicals of the past decade. The star sang “All That Jazz” which must have been a breeze the second time around considering she was well-rehearsed and didn’t have a baby on the way. 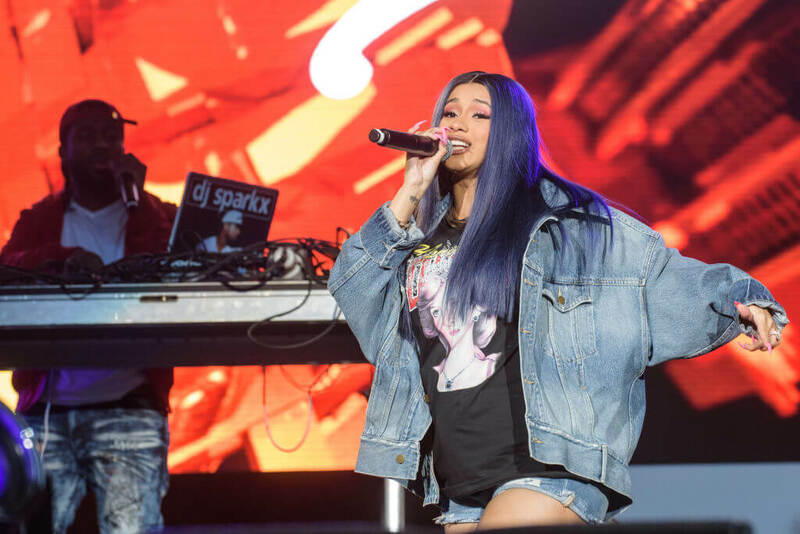 Years before Cardi B graced Saturday Night Live with her baby bump, there was another rapper who hit the sketch comedy show’s set with a baby-in-tow. Amy Poehler isn’t exactly known for her singing chops, but pregnancy apparently blessed her with the ability to spit a fire verse. 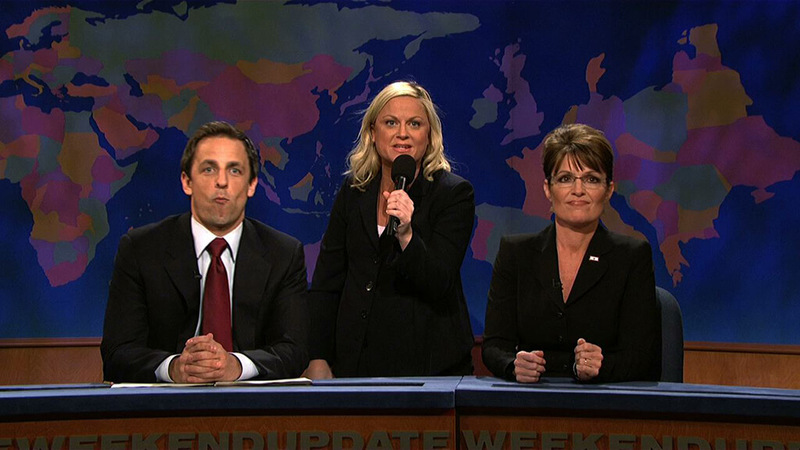 In 2008 episode of SNL, Poehler burst into song on Weekend Update after Sarah Palin (Tina Fey) bailed on a bit about her campaign. Instead, Poehler picked up the mic and rapped about killing moose while accompanied by a group of Eskimos. There are few duos as iconic as Poehler and Fey, and even a pregnancy can’t slow them down. Posh Spice may have been in one of the best-selling girl groups of all time, but that didn’t mean she was immune to morning sickness. Though you’d never be able to tell from her performances (which looked utterly effortless) the star had a very difficult pregnancy. According to Mel B, the 1998 Spiceworld Tour was difficult for Beckham. She was pregnant with her first child and suffering from debilitating morning sickness. She allegedly threw up between performances and had to run off stage to vomit mid-set. That’s news to us, considering Beckham has the poise of a literal angel and never faltered in a way fans could notice. Mel B (a.k.a Scary Spice) was a whole lot luckier than Victoria Beckham. She didn’t have the debilitating morning sickness. In fact, she said her pregnancy was “super easy” which is exactly what it looked like for fans watching the Spiceworld Tour. Both Beckham and Mel B were pregnant with their first children during the 1998 Spiceworld Tour. We can’t even imagine what kind of comradery there would’ve been on the Spice Tour Bus with two pregnancies, but it apparently wasn’t a lifelong bond. The singer was allegedly snubbed by Beckham after asking her to join her on The X Factor where she was a judge. 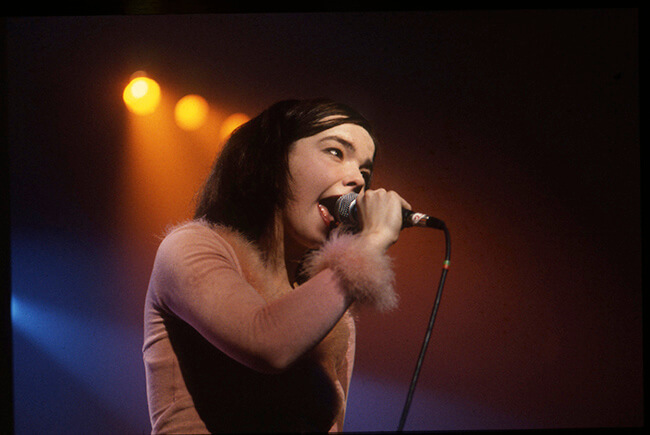 Bjork has always been one for kooky fashion choices. The Icelandic singer famously wore a swan dress on the red carpet (and that was before Lady Gaga hit the scene with meat clothes and bubble dresses.) Her tiny black crop top may not have been as zany as usual, except for the fact that she chose to accessorize it with a baby bump. While Bjork was pregnant with her first child, she performed with KUKL live on TV. Her performance was so energetic it erred on frantic. Seeing her bop around with a baby bump and scream into the mic is actually pretty infectious. She welcomed her son in June the same year. When the streaming giants call, you must answer, even if you’re 7 months pregnant. Ali Wong, who may be best known for her work on Fresh Off The Boat, graced headlines after her stand-up special Baby Cobra debuted with a surprise guest – her very pregnant belly. Wong made the conscious decision to shoot the special while she was pregnant because it made her feel powerful. 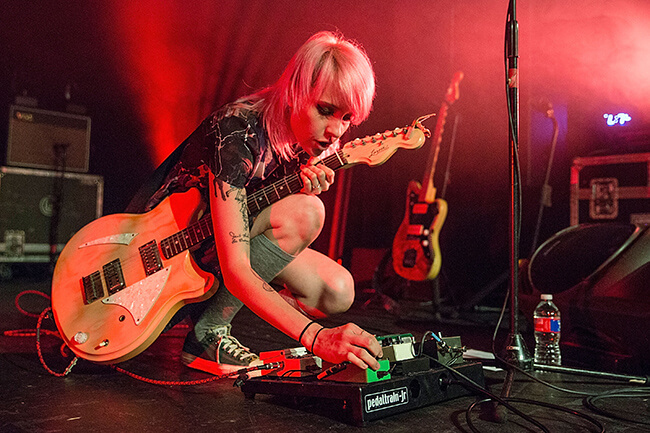 Sherri DuPree Bemis of the indie rock band Eisley may just be the cutest pregnant person on the plane. The singer has had three adorable children and gigged through each pregnancy like it was nothing. How did she do it? She always managed to keep her sense of self, even while dealing with the most difficult parts of motherhood.